Meet the Plotmonkeys: Writers and friends who keep me sane, make me laugh until I cry and help me beat my plots into something intelligible. And then the magic starts. Plot holes are filled, motivations explained and panic subsides. You’d think such a seemingly random group of goofballs would clash. A women’s fiction author, a young adult (YA) author, a dark fantasy author, an author of a set of forthcoming short stories (think the Italian-American version of David Sedaris), and me, a steampunk author. But we don’t. Instead, working to help plot a completely different kind of novel stretches the brain, and sends all of us home with so much more than merely a plot for our next book. 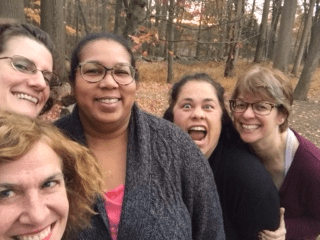 Just this past November, we got together for one of our infamous weekends and the plot for a new book (tentatively titled Venom & Lies: Book Four in The Elemental Web Chronicles) took shape. Wait, what about Book Three, you ask? That book, The Iron Fin, is drafted… and has begun a long editing process involving much red ink.